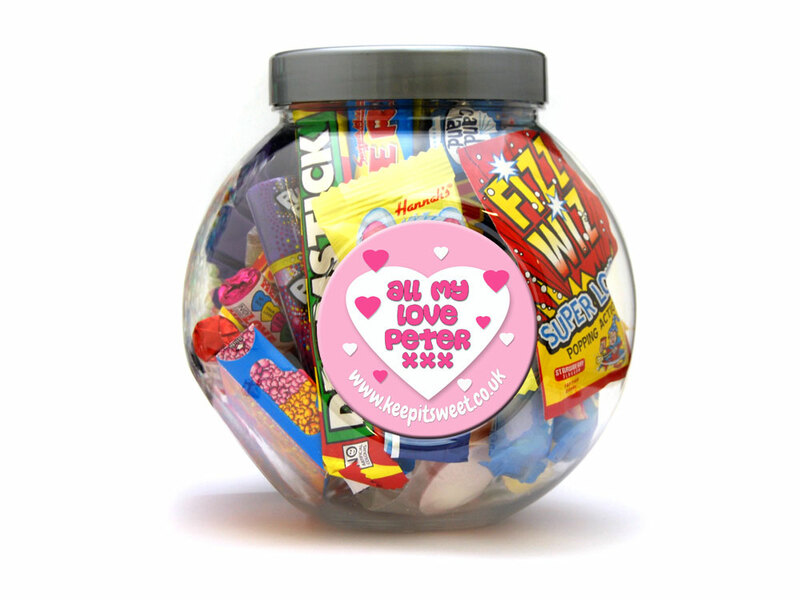 Let someone know you really care by giving them this nostalgic plastic jar of great love themed retro sweets. Propose with a Ring Pop or make there day with a Love Heart. 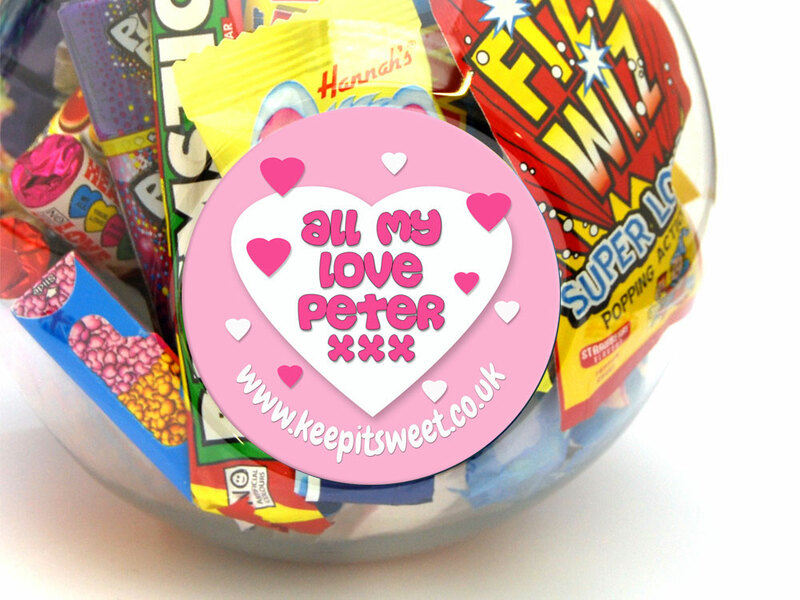 Crammed with loads of favourite retro and love themed sweets this will put a big smile on someones face. Wham Bar: Glucose Syrup, Sugar, Water, Palm Oil, Maltodextrin, Citric Acid, Hydrolysed MilkProtein, Stabiliser (Gum Arabic), Humectant (Glycerol), Emulsifier (E471), Colours (Anthocyanins, Chlorophyll, Curcumin), Acidity Regulator (Sodium Citrate). May contain traces of Milk and Soya. LoveHearts: Sugar, Acidity Regulator (Malic Acid, Stearic Acid), Bicarbonate of Soda, Modified Starch, Magnesium Stearate, Anti-Caking Agent (Magnesium Carbonate), Colours: Beetroot Red, Anthocyanins, Copper Chlorophyll, Lutein, Paprika Extract). Cherry Drops: Sugar, Glucose Syrup, Acid (Citric Acid), Flavouring, Colours: Anthocyanins. May Contain Traces of Milk, Soya and Nuts. Fried Eggs: Glucose Syrup, Sugar, Dextrose, Gelatine, Citric Acid, Flavourings, Fruit and Plant Concentrates (Orange, Lemon, Mango, Passion Fruit), Glazing Agents (Carnauba Wax, Beeswax, Carob Extract). Chupa Chups: Cocoa-Vanilla and Caramel: Sugar, Glucose Syrup, Whey Powder, Whole Milk Powder (2%), Cocoa Butter, Salt, Flavourings, Colours (E100, E150c). Strawberry-Cream: Sugar, Glucose Syrup, Fruit Puree 3% (Apple, Cherry, Raspberry, Pineapple, Lime, Lemon, Strawberry, Peach, Banana, Orange, Blueberry, Blackberry, Mango, Watermelon, Kiwi), Whole Milk Powder (2%), Cocoa Butter, Flavourings, Colour (E162). May Contain Traces of Milk, Soya and Wheat. Warning: Choking Hazard. Not suitable for children under 36 Months. Heart Lolly: Sugar, Glucose Syrup, Citric Acid, Colours (E100, E102, E110, E122, E124, E132, E133, E142, E153, E155, E171). Warning: Choking Hazard. Not suitable for children under 36 Months. May cause an adverse effect on children.